Get behind the wheel of the 2018 Motor Trend Car of the Year today at Southern Alfa Romeo of Norfolk from under $40,000! 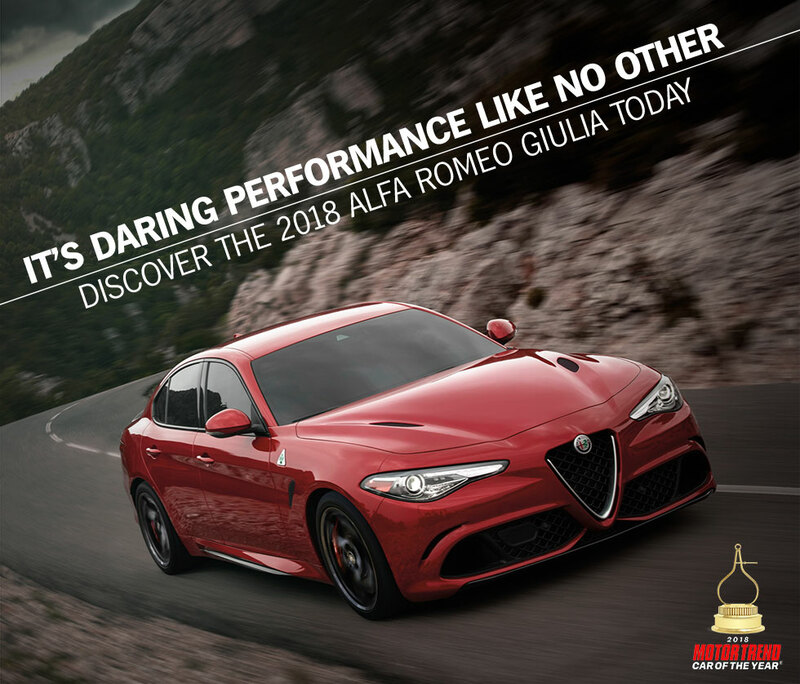 The 2018 Alfa Romeo Giulia comes in 6 exciting trims: Giulia, Giulia Sport, Giulia TI, Giulia Ti Lusso, Giulia Ti Sport and the daring Giulia Quadrifoglio. With the exception of the Quadrifoglio, which is RWD only, they all come with your choice of RWD or AWD. Choose your favorite trim today and discover world-class performance behind the wheel of this Italian masterpiece today! Southern Alfa of Norfolk is proud to serve drivers from the Norfolk, Chesapeake, Portsmouth, Hampton and Virginia Beach areas. With six available models, your new 2018 Giulia can be as versatile as you are. All models come paired with a 8-speed automatic transmission for ultimate performance. The 2018 Giulia base, Sport, Ti, Ti Lusso and Ti Sport in RWD comes standard with a 280-hp 4-cylinder turbo that can deliver 306 lb.-ft. of torque at 4,800 rpm and can go from 0-60 MPH in just 5.5 seconds! This configuration also gives Norfolk, Chesapeake, Portsmouth and Hampton drivers an impressive EPA-estimated 33-MPG on the highways of Virginia. Choose these models with AWD and go from 0-60 MPH in just 5.1 seconds! Prefer more power? Choose the 2018 Giulia Quadrifolio and prepare to go 0-60 MPH in just 3.8 seconds! The new Quadrifolio delivers amazing power thanks to its 505 hp 2.9L Twin-Turbo V6 that can deliver up to 443 lb.-ft. of torque at 5,500 rpm. Get behind the wheel of the new 2018 Giulia and you'll find a premium interior with the latest technology to keep you safe and connected. The Alfa Giulia's cutting-edge safety tech includes rear parking assist sensors, remote-start system, rear back-up camera, LED Daytime running lights and more! Plus, an available Blind Spot Monitoring system that is further complimented with an available Driver Assistance Dynamic Package. This package includes lane departure warning, forward collision warning plus, automatic high-beam headlamps, adaptive cruise control with full stop and an infrared windshield. The 2018 Giulia also features a standard 8.8-inch widescreen color display with touch control includes Apple CarPlay® and Android Auto™, Bluetooth®, an 8-speaker audio system and more! At Southern Alfa Romeo of Norfolk, we make owning or leasing your next Alfa Romeo Giulia even more affordable with the Southern Hospitality Buyers Program, included at no additional cost. Take a look below at the list of benefits that we have included to save you thousands more over the lifetime of your car purchase or lease! Ready to get behind the wheel? Test-drive the new 2018 Alfa Romeo Giulia today at Southern Alfa Romeo of Norfolk in your preferred trim. Not sure which one you like best? Our knowledgeable and friendly team members are ready to help you find the new 2018 Alfa Romeo Giulia that best fits your lifestyle. Stop by today and start saving! We serve drivers in the Norfolk, Chesapeake, Portsmouth, Hampton and Virginia Beach areas.